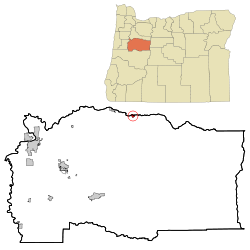 Mill City is a city in Linn and Marion counties in the U.S. state of Oregon. The population was 1,855 at the 2010 census. It is on the North Santiam River, downstream from Detroit Lake. The Mill City railroad bridge, now a pedestrian bridge, is a Phoenix Column Bridge, built by Phoenix Iron Works, Phoenixville, PA It was manufactured in 1888, moved to San Jose, CA then Lake Oswego, Oregon then to Mill City Oregon, installed 1919. Abandoned by Southern Pacific railroad around 1967 and used as a pedestrian and bike bridge. Current restoration efforts are being undertaken by the 'Save our Bridge" Foundation. From 1998 until 2014, the Mill City Independent Press (formerly known as the Enterprise) covered local news. It was owned by Phil Foster and then by Bill Downer, a former logger and former mayor of Mill City, and his wife Judy Downer. The area is currently served by The Canyon Weekly, started in 2010 by Karen & Tim Widmer and Michelle Gates. Mill City is served by a non-commercial 100-watt community radio station that went on the air in 2014. KYAC-LP 94.9 is an all-volunteer radio station that serves Mill City, Gates, Lyons, Mehama, Elkhorn and the Little North Fork. It is owned by Santiam Hearts to Arts. According to the United States Census Bureau, the city has a total area of 0.83 square miles (2.15 km2), all land. As of the census of 2010, there were 1,855 people, 681 households, and 475 families residing in the city. The population density was 2,234.9 inhabitants per square mile (862.9/km2). There were 742 housing units at an average density of 894.0 per square mile (345.2/km2). The racial makeup of the city was 90.7% White, 0.4% African American, 1.9% Native American, 0.4% Asian, 0.6% Pacific Islander, 2.0% from other races, and 3.9% from two or more races. Hispanic or Latino of any race were 9.2% of the population. There were 681 households of which 36.1% had children under the age of 18 living with them, 49.3% were married couples living together, 13.8% had a female householder with no husband present, 6.6% had a male householder with no wife present, and 30.2% were non-families. 22.8% of all households were made up of individuals and 8.1% had someone living alone who was 65 years of age or older. The average household size was 2.72 and the average family size was 3.14. The median age in the city was 36.2 years. 27.9% of residents were under the age of 18; 8.2% were between the ages of 18 and 24; 24.2% were from 25 to 44; 26.3% were from 45 to 64, and 13.5% were 65 years of age or older. The gender makeup of the city was 51.8% male and 48.2% female. In the city, the population was spread out with 30.1% under the age of 18, 7.7% from 18 to 24, 26.7% from 25 to 44, 22.2% from 45 to 64, and 13.3% who were 65 years of age or older. The median age was 36 years. For every 100 females, there were 102.2 males. For every 100 females age 18 and over, there were 96.9 males. Mill City is the home of Santiam Elementary School and Santiam Junior/Senior High School. Mill City is served by the Santiam Canyon School District. ^ "Saving the bridge: Preserving an historical Mill City icon". ^ Utz, Annette (9 May 2014). "Press closes in Mill City". Statesman Journal. ^ "Santiam Canyon School District". Reinhardt, Bob. "Mill City". The Oregon Encyclopedia.